Today’s guest post is by author Jeffrey Ryan. Our first climb together was a bushwhack up a spruce-blanketed western Maine mountain called Kibby. I was in the midst of attempting to climb Maine’s highest 50 mountains in a year with another hiking buddy, so we asked Wayne to join us. When we got back down from Kibby’s summit, Wayne suggested doing another climb sometime. I considered this a good sign because what we’d just done was more like spending a day forcing our bodies through the brushes of a carwash than hiking. A hike on a mountain with trails on it would certainly be a better choice. Wayne had always wanted to climb Katahdin (Maine’s highest peak and one of my favorite hikes). Wayne suggested bringing a group of his Connecticut friends up for a September climb. On September 7, 1985, our group stood on Baxter Peak marveling at the scene stretched out across the Maine wilderness in all directions. What none of us knew was that this moment marked the beginning of the adventure of a lifetime. 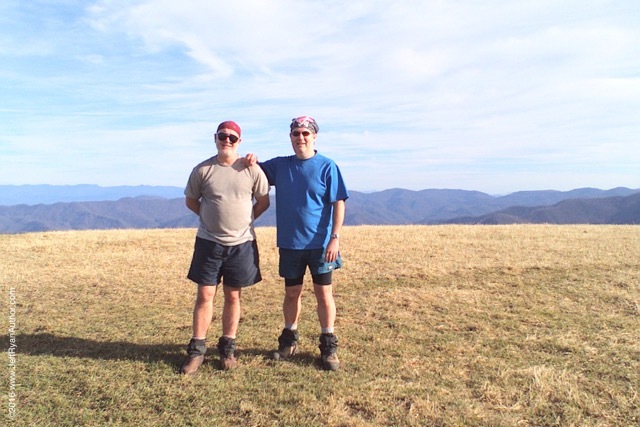 Over the next 28 years, Wayne and I hiked the entire Appalachian Trail one section at a time. Looking back on what many (including us) think is a pretty amazing accomplishment, I’ve given a lot of thought to how many miles and exploits we’ve experienced over thousands of miles and what made this friendship endure and strengthen rather than devolve and unwind, an experience some traveling partners know all too well. There were many reasons why this friendship might never have materialized. For one, we were almost complete opposites. Wayne was an introvert that was all about systems and process — a “go with the plan” guy. I was an extrovert that was all about adapting to the situation at hand — a “go with the flow” guy. This could have been a potentially toxic mix of one of us driving the other crazy if it hadn’t been for the one thing that centered both of us, the adventure that awaited us every day on the trail. Hiking with someone else is an incredible mix of contradictions as it is. Periods of self reflection and solitude are intertwined with periods of camaraderie (such as stopping at a viewpoint) and shared decision making (how many miles do you want to do today?, What do you want for dinner?, What do you think about camping here?, etc.). In the beginning I remember having a few, “I wish he’d stop focusing on the mileage” moments, just as I’m sure Wayne had his, “I wish I didn’t have to reel this guy in” moments. But over time what we discovered was that the more we let go of some of our preconceived notions about “the way things should be”, the more we were open to appreciating the perspectives each of us brought to the adventure. And those perspectives were exactly what we needed to have. Toting a 60-pound pack up and over mountains for a hundred miles in a week requires you to evoke a number of skills. Perseverance, athleticism, planning and progress are constantly vying for your attention. It was quickly clear that in our partnership that my capabilities were strongly rooted in the first two skills, whereas Wayne’s were in the latter. This was a beautiful thing. There were days when I urged Wayne to push for another two miles. There were others where he pointed out that we didn’t need to make the extra push to stay on schedule, that perhaps more rest was in order. That was to be expected, given our personalities. But as most travelers know, it’s the unexpected that reveals the greatest discoveries. During the last several years of our hike, I noticed that I was thinking more like a planner and Wayne was urging me to climb up one last ridge before we pitched camp. We had given each other the gift of a wider perspective. After we shook hands on the summit of Springer Mountain Georgia on October 30, 2013, some 28 years and 2,100 miles after our Appalachian odyssey began, we walked in silence. “Maybe we both need a few minutes to process what we’ve just accomplished”, I thought. It was one of the most poignant moments of my life. For it was here, fittingly on a mountain trail, that I didn’t merely discover but felt in my heart that this journey of ours wasn’t built on accomplishments but on shared experiences. Those experiences had forged a friendship that endured everything the years and miles brought our way, yet still yearned for more. Jeff Ryan is the author of Appalachian Odyssey: A 28-year hike on America’s trail, published by Down East Books and now available for pre-order on Amazon.com. Jeff will soon be hitting the road in his 1985 Westfalia for a nationwide book tour, to be chronicled in his blog. Learn more at www.JeffRyanAuthor.com. Absolutely love this post! A friendship forged out of purity, honesty & a love for nature. Glad you felt that way, too, Dan! Thanks for reading and sharing! 🙂 I loved Jeff’s story of this friendship!